Having a sufficient number of the right type of fire extinguishers present at your facility is important. Yet, without proper maintenance, these units may not provide the protection you need. Why? Your extinguishers must be kept in working order, otherwise they may fail to function at full capacity (or at all) when called upon to subdue a fire. In addition, not performing the required maintenance can lead to costly code violations. Therefore, it is important to learn the basics of fire extinguisher maintenance and what is required to ensure that they are at peak readiness at all times. Check out the fire extinguisher maintenance steps below. Are the units in proper locations? Are the units in clear view and properly accessible? Are the units in clean condition? By the naked eye do the units appear to be operable? Have the monthly inspection tags been properly signed? Check the test and maintenance dates. Visually inspect pressure gauge (when applicable). Install new tamper seal (some units may require additional inspection procedures). Remove discharge hose and inspect valve assembly. Check CO2 hoses for continuity (when applicable). Attach a new certification tag. Complete Fire and Safety Report. Ensure customer understands completed work. The NFPA requires that maintenance on all portable fire extinguishers present at your facility be completed on an annual basis. This is the minimum requirement, and if your monthly inspections reveal any problems, then maintenance may need to be performed even more often. Finally, tamper seals must be installed after your annual maintenance is complete. The hydrostatic test is required every five years for carbon dioxide, water-based extinguishers and some other types. 6 year maintenance is required for all extinguishers which are subject to the 12 year hydrostatic test. 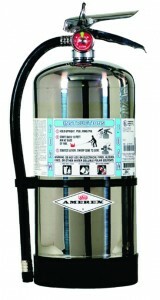 This includes most stored-pressure extinguishers which can be recharged. If the extinguisher passes the six year inspection, a label needs to be affixed to the unit stating that the extinguisher has been inspected. The tag lists the person who completed the inspection and their affiliated agency, so the inspection must be completed by a qualified organization, such as Koorsen Fire & Security. The 12-year hydrostatic test is required on most stored-pressure units and all cartridge-operated extinguishers. If all of the above inspections and tests are completed with satisfactory results, you will be in full compliance with all of the fire codes and regulations governing extinguisher maintenance. You will also have peace of mind, knowing that your extinguishers are working properly, should the need for them arise. However, keep in mind that there are maintenance procedures which are specific to specialized types of units - which is why working with a certified company is critical. Koorsen is always up to date on the latest requirements, and our knowledgeable and experienced staff can handle any type of extinguisher maintenance. To partner with a leader in the fire extinguisher field, contact Koorsen Fire & Security today.